Citroen has always Done Things Differently. For most of the time, Citroens have also looked like it when they were doing things differently - either unconventionally pretty (the DS) or boldly individual (virtually everything else). A few years ago, after a series of dull cars like the Xantia and the C4, the French company reminded itself that's what it did, and out popped the deadly cool - and polarising - Cactus. Critical acclaim followed, even if smash-hit global sales didn't. 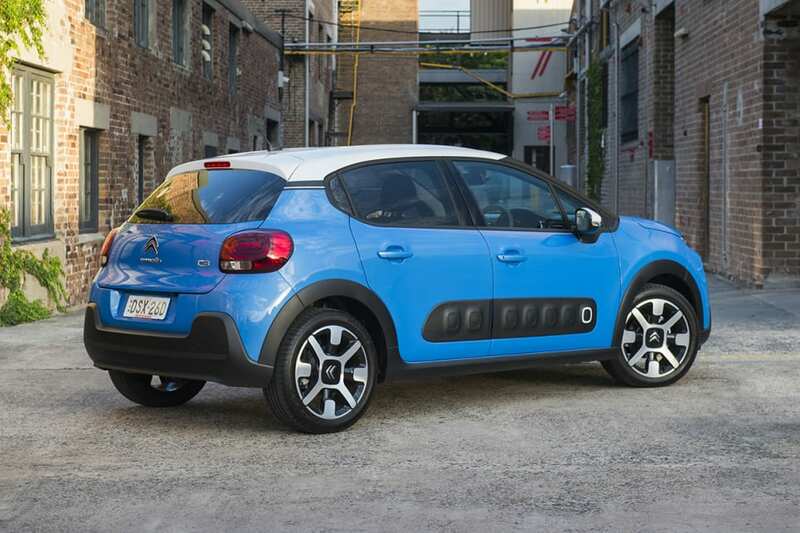 Undeterred, the new C3 draws much from the Cactus but it also takes its own path to reboot Citroen's small hatchback. And it's not just about looks. It's got Peugeot-Citroen's global A platform underneath it, a fizzy three-cylinder engine and a cool interior. Right off the bat, this isn't a cheap runabout. Starting at $23,490, there's just one trim level, the Shine and it's not a bare-bones starter. So, a sensibly short price list, then, with just the hatchback bodystyle. Those who remember Citroen's last C3-based soft top, the Pluriel, won't mind that it hasn't made a return. For the first month it's on sale - March 2018 - Citroen is offering a drive-away price of $26,990 including metallic paint. I think the C3 buyers will compare the new car with compact SUVs like the Mazda CX-3 and Hyundai Kona. When you look at the size and shape vs the the other two, they look like they belong together. While those other two come in a range of trim levels, you don't have to think too much about the Citroen. There's Apple CarPlay and Android Auto to look after your media and GPS sat nav needs. Included features are 17-inch 'diamond-cut' alloy wheels, cloth trim, remote central locking, reversing camera, auto headlights and wipers, leather steering wheel, trip computer, climate control air conditioning, rear parking sensors, cruise control, power windows all around, speed limit recognition and a space-saver spare. A 7.0-inch touch screen, like sister Peugeots, runs a variety of functions including air-conditioning and I continue to wish that it didn't. The basic multimedia software is rather good these days, which is a blessing, and the screen a good size. 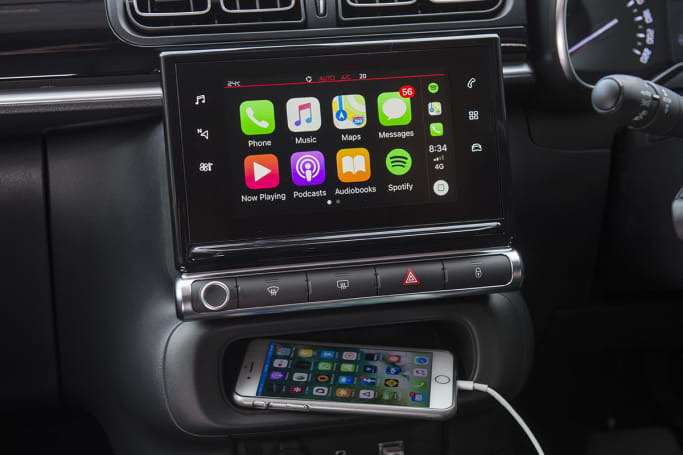 There's also Apple CarPlay and Android Auto to look after your media and GPS sat nav needs, softening the blow of the lack of a built-in navigation system. Of course you can connect your iPhone or Android device or whatever via Bluetooth or USB. While it might look ready to go off road, its more a city pack than a sport edition, especially with the damage-saving Airbumps. The sound is good from its six speakers, but there's no subwoofer, DAB, CD changer, MP3 function. Which colour you choose depends on much much you want to spend. An interesting and reasonably-priced choice is the spearminty 'Almond Green' going for $150. The metallics cost a bit more at $590. They range from 'Perla Nera Black', 'Platinum Grey', 'Aluminium Grey', 'Ruby Red', 'Cobalt Blue', 'Power Orange' and 'Sand'. 'Polar White' is the only freebie and gold is off the menu. You can also choose from three roof colours, fling the tin altogether for the $600 panoramic sunroof, add some red flashes in the interior for $150 or go bronze with the Colorado Hype interior ($400). Even the Airbumps come in black, 'Dune', 'Chocolate' (brown, obviously) and grey. You can choose from three roof colours. 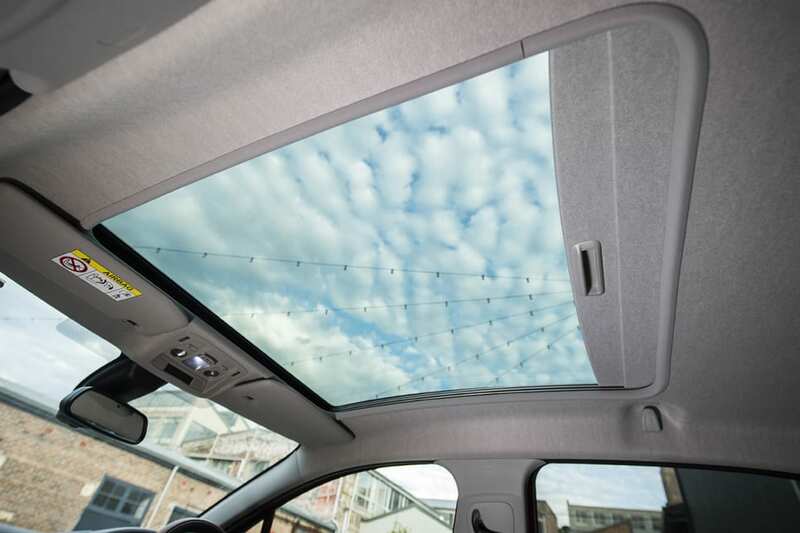 Or fling the tin altogether for the $600 panoramic sunroof. 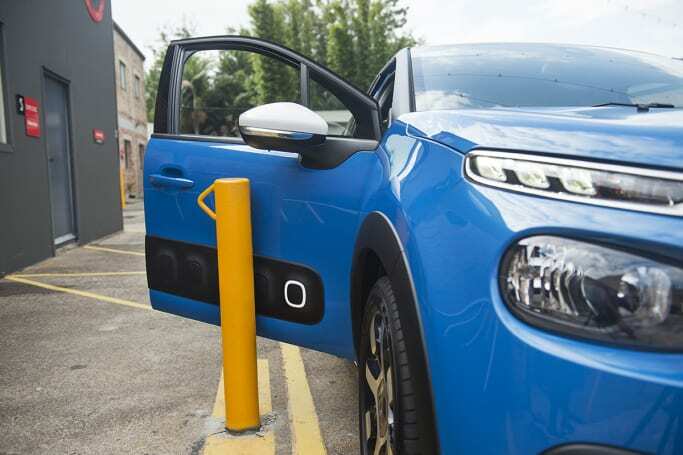 A built-in dash camera called 'ConnectedCAM' ($600) is also available, with Citroen claiming it as a segment-first. Mounted in front of the rear-view mirrors, it creates its own Wi-Fi network and you can control it with an app on your phone. You can take some video or pics with it (the two megapixel camera is okay) but it also continuously records what's happening in front of you, using half of the 16Gb memory card. In a crash it acts like a sort of black box, with 30 seconds pre-stack and 60 seconds post. And yes, you can switch it off. Your dealer will no doubt be able to supply you with accessories like floor mats, towbar, roof rack and roof rails. Absent from the options list is a black pack or park assist function. Which colour you choose depends on much much you want to spend. I reckon the C3 looks great. It takes much of what is brilliant and brave from the Cactus and makes it work in a smaller footprint. Calling it characterful is an understatement, with a big chin, slim LED daytime running lights and headlights set lower in the bumper. Sadly there are no LED headlights or xenon option. The DRLs are joined by a two lines of brushed metal that stretch across the car and incorporate the double chevron logo. In the rear vision mirror, you'll know exactly what's following you. In profile you see the re-designed Airbumps, the source of such controversy and mirth on the Cactus. They're not as big and the bumps themselves square ("Why does the car have a home button?" my wife asked), but they work. And around the back are a set of cool LED tail-lights with a 3D effect. 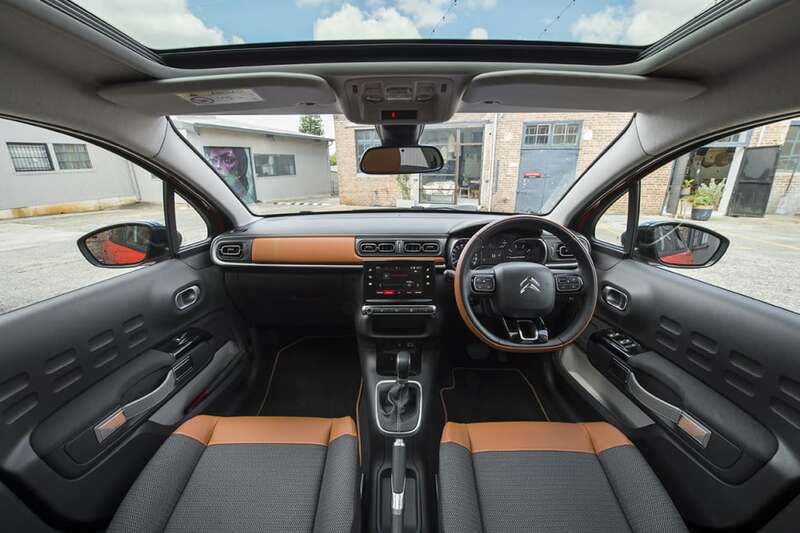 The C3 takes much of what is brilliant and brave from the Cactus and makes it work in a smaller footprint. Calling it characterful is an understatement. 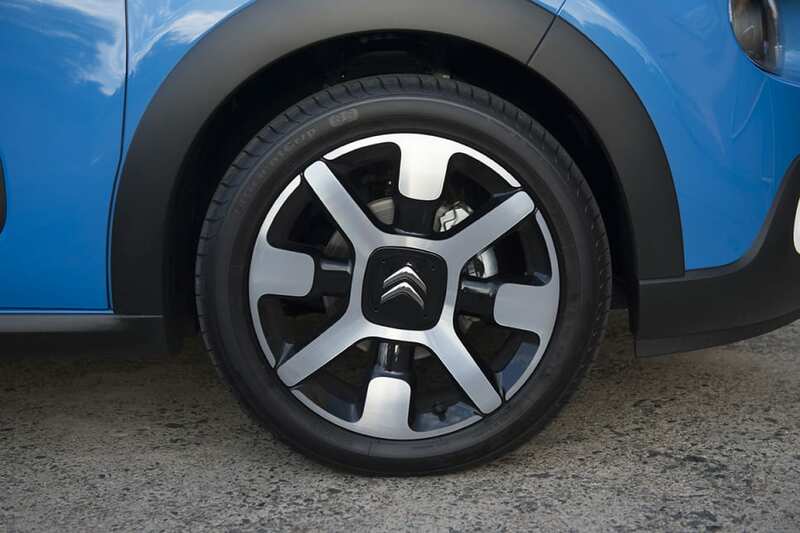 17-inch 'diamond-cut' alloy wheels come as standard. While it might look ready to go off road, its more a city pack than a sport edition, especially with the damage-saving Airbumps. No body kit is offered, which is probably for the best as it would ruin the look. The ground clearance is nothing out of the ordinary, nor is the 10.9 metre turning circle. Inside is, again, Cactus-ey, but less avant-garde (or prickly - sorry). The luggage trunk-style door pulls are there, the door cards feature an Airbump motif and the overall design is just cool. Some slight materials mismatches highlight blanking panels and joins, but it's otherwise quite pleasing to the eye and is most definitely Citroen, right down to the funky air vents. 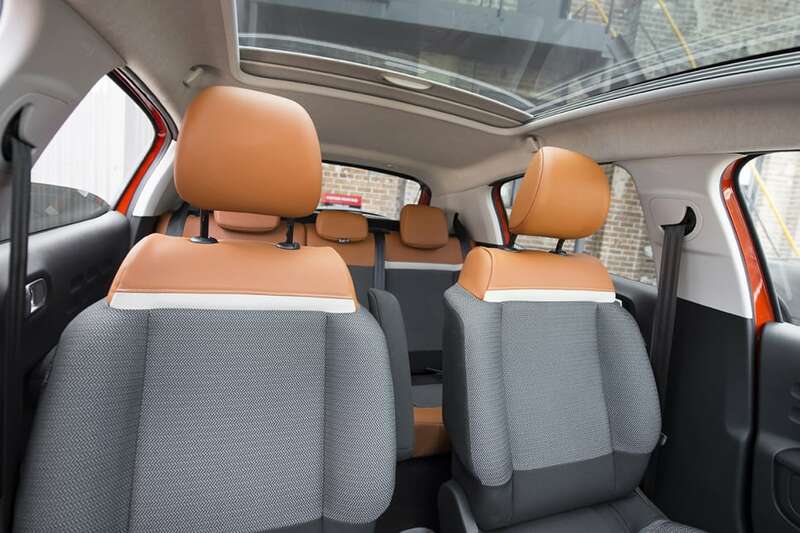 The materials on the seats are well-judged and interesting if you go with the Colorado Hype interior, which also includes judicious use of a burnt orange leather on the steering wheel (no leather seats, though). The dash is clear and concise, although, the central screen still looks like an 80s digital watch. Whether that's intentional or not I don't know, but a proper high-res screen would be easier on the eye. The dash is clear and concise, although, the central screen still looks like an 80s digital watch. The Colorado Hype interior includes judicious use of a burnt orange leather on the steering wheel. The materials on the seats are well-judged and interesting if you go with the Colorado Hype interior. Ah, so French. For some reason, there are just three cupholders (two up front, one for the back) but each door will hold a bottle. While the titchy exterior dimensions suggest tiny interior dimensions, once you climb inside you may be in for a pleasant surprise. You'll probably ask yourself "How many seats can you fit in there?" but the answer is five. And you could nearly get five people in there, too. The dash on the passenger side is pushed right up against the bulkhead so the front passenger feels like they've got a ton of room, although it does mean the glove box isn't very big and the owner's manual ends up in the door. You can leave it behind, though, because you can load the 'Scan My Citroen' app on your phone which allows you to choose certain parts of the car and show you the relevant part of the manual. 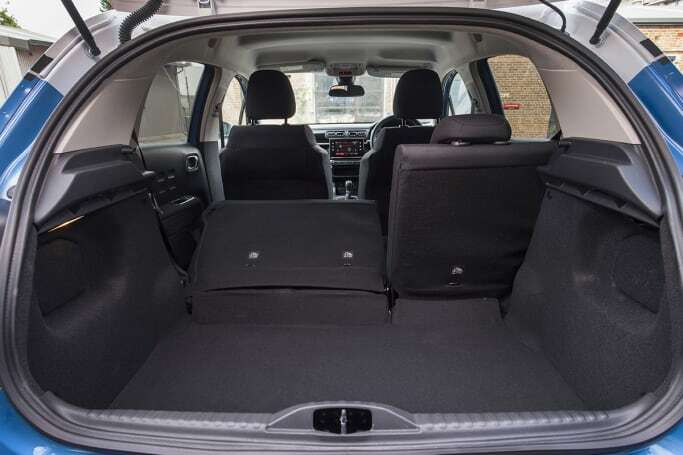 Boot space starts at 300 litres with the seats up and better than tripling to 922 with the seats down, so luggage capacity is good. Rear seat passengers do okay as long as nobody in the car is above about 180cm or have freakishly long legs. I was quite comfortable behind my driving position and the rear bench comfortable enough. Boot space starts at 300 litres with the seats up and better than tripling to 922 with the seats down, so luggage capacity is good. The loading lip is a bit high, though and the dimensions of the opening a little tight for larger items. Towing capacity is an appropriately meagre 450kg for a braked trailer. 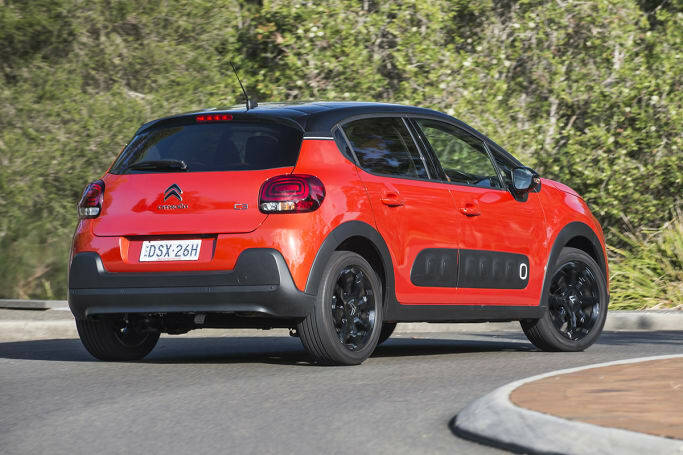 The C3 is powered by the now familiar (Cactus, Peugeot 208 and 2008) three-cylinder, 1.2-litre, turbo-petrol engine. Developing 81kW/205Nm and it has just 1090kg to push. The question of timing belt or chain is answered simply - it's a chain. 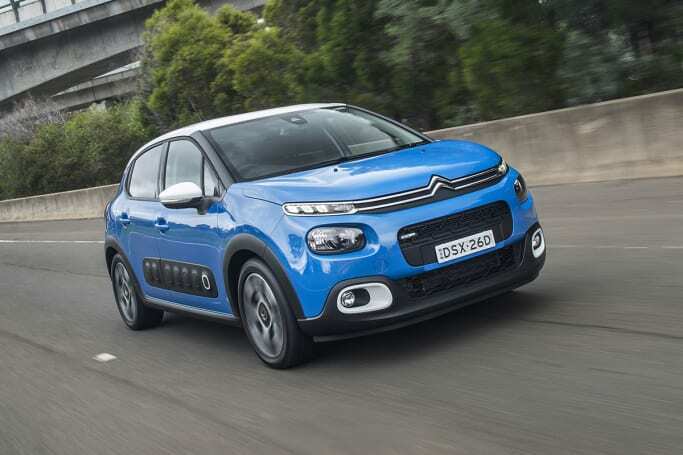 The C3 is powered by the now familiar (Cactus, Peugeot 208 and 2008) three-cylinder, 1.2-litre, turbo-petrol engine. 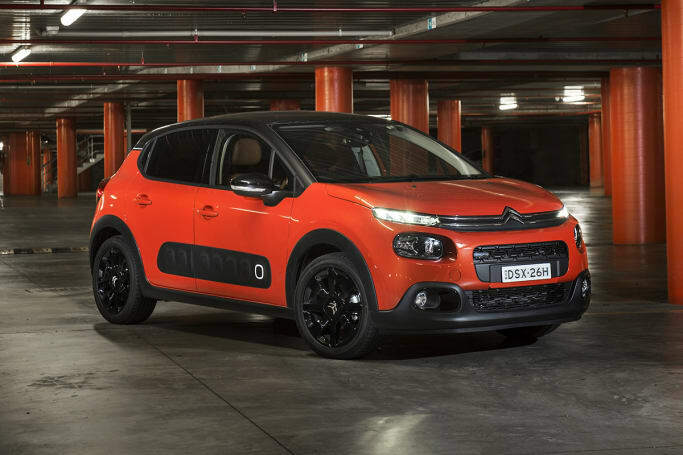 The C3 is front-wheel drive and the power is channelled through a six-speed Aisin-sourced automatic transmission. Thankfully that tragic semi-auto single clutch gearbox is a goner. There is no manual, LPG, diesel (so no diesel specs) or 4x4/4wd. Oil type and capacity information can be found in the owners manual. 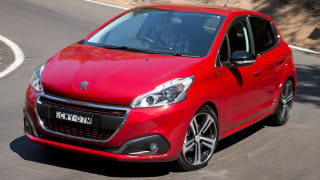 Peugeot claims 4.9L/100km on the combined cycle and it's worth noting the triple does drink 95 RON fuel. Usually on a launch the fuel figure is meaningless but a mix of M roads and B-roads delivered a 7.4L/100km figure for the day's motoring. Fuel tank capacity is 45 litres. At the claimed rate of petrol consumption, that would give you a range of almost 900km but reality is closer to 600km per tank. There's no eco mode to eke out further mileage but there is start-stop. This engine is so close to delivering diesel fuel economy, an oil burner would be a complete waste of money. 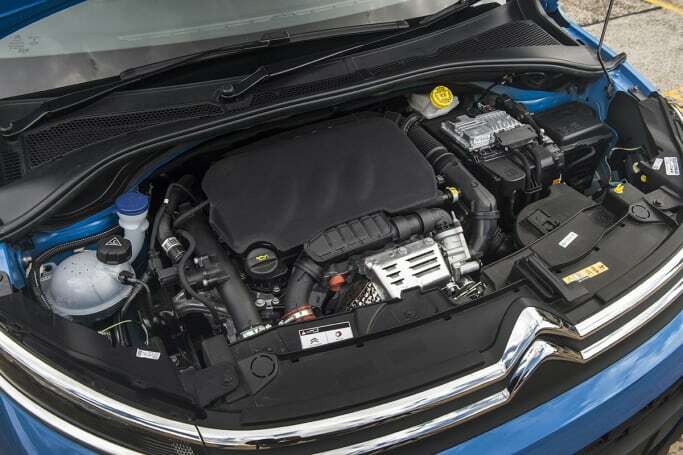 A quick look at overseas-spec cars' diesel fuel consumption figures will confirm this. 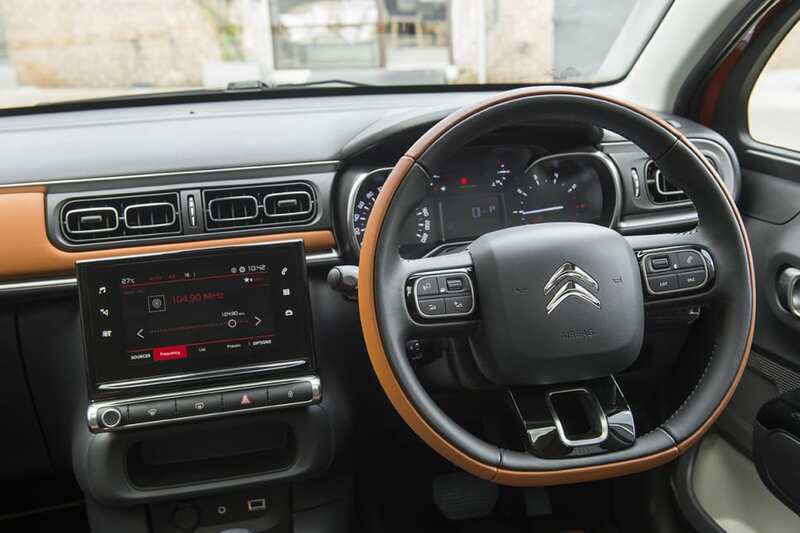 The C3 has a standard airbag count of six, ABS, stability and traction controls, ESP, lane departure warning and speed sign recognition as standard, along with two ISOFIX points in the rear. 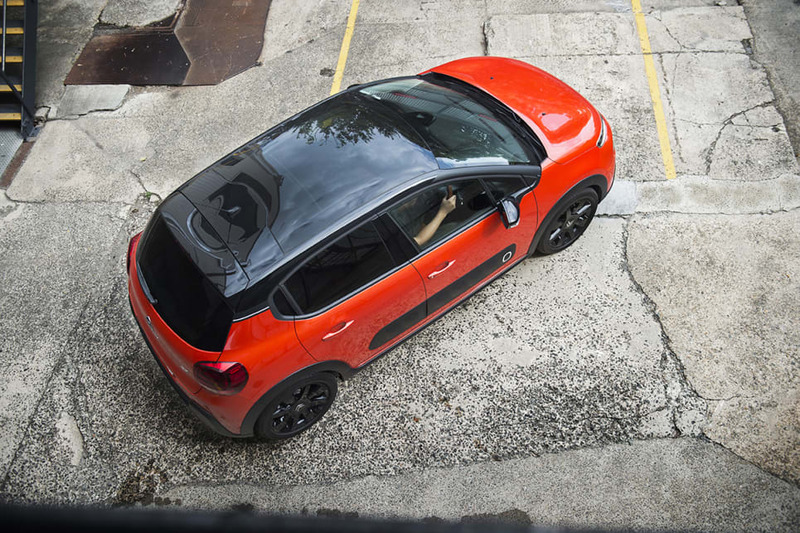 A no doubt frustrated Citroen told us the C3 scored a four star EuroNCAP safety rating due to a lack of forward AEB tech but the car is "structurally sound." AEB is only now being rolled out overseas, so it might be a few months before we see it, and the car is retested. Citroen offers a five year/unlimited km warranty, with five years roadside assist. Service cost is capped for the first five years. 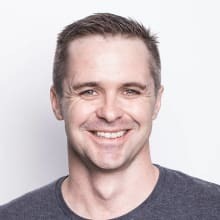 Service intervals are 12 months/15,000km and start at a not inconsiderable $375, bouncing around between $639 and $480-ish then making random leaps over $1400. You know what you're up for, but it isn't cheap. As for common faults, problems, complaints and reliability issues, it's a brand new car, so there's not much to say. Obviously diesel engine problems are a thing of the past. Let me tell you what the C3 is not and never has been - a corner carver. Years ago when I used to suffer the drudgery of commuting between Sydney and Melbourne, my car was in Sydney and home was in Melbourne. It made more sense to hire a car to get home from the airport (bear with me) and the cheapest weekender was always that older humpback C3. It was slow and generally inept, suffered from automatic transmission problems, had no horsepower and too much weight to drag around but it rode really well from memory. Had a flat battery more than once, too. Well. Two generations on and things are rather better. The three-cylinder turbo, as it is in every other car it's in, is a terrific motor. While the 10.9 second 0-100km/h acceleration figure is hardly earth-shattering or even dust-scattering, the cheerful enthusiasm with which power is delivered is infectious and smile-inducing. The character belies the small engine size and specifications. The steering is good and while direct, will bring out the fact that this isn't a hungry apex predator. The six-speed Aisin automatic could probably do with a bit of finessing in traffic, sometimes slow on the upshift, but Sport mode fixes that issue. The steering is good and while direct, will bring out the fact that this isn't a hungry apex predator. The C3 lopes along, with a ride belying its diminutive stature. Little cars like this tend to jiggle and we always blame cheap-but-effective rear torsion beam rear suspension. That excuse is out the window now because Citroen seemed to have worked out how to make them (mostly) soft. Our test drive route took in motorways and B-roads, one of which was appallingly patchy. The only time the car felt like it had torsion beams was when a particularly knobbly bit of road caught out the rear end a bit, with a little skip. I call that lively, some would call it inconvenient, but the car for the rest of the time was beautifully composed, tending to gentle understeer in enthusiastic cornering. Around town the ride is effortless and compliant, feeling like a bigger car. Around town the ride is effortless and compliant, feeling like a bigger car. My wife agreed. Part of the comfort level also comes from the excellent front seats which don't look particularly supportive but really are. There are some annoying things. The touchscreen is a bit slow and if the C3 has an AM radio (quiet, young folks), I couldn't find it. It is there, I just couldn't find it, so it needs better software (or a better user). It also needs AEB and it would be nice if it could match a Mazda CX-3's or even Mazda2's safety features, so it could do with reverse cross traffic alert and reverse AEB too. The three cup holder thing is weird and the cruise control stalk is a bit of an art to master. The start-stop is also a bit aggressive and doesn't know when it's not wanted - you have to use the touchscreen to switch it off. And for those who do want it, they're getting a car with a great engine, ride that shames bigger cars and a style you can't miss or fail to talk about. 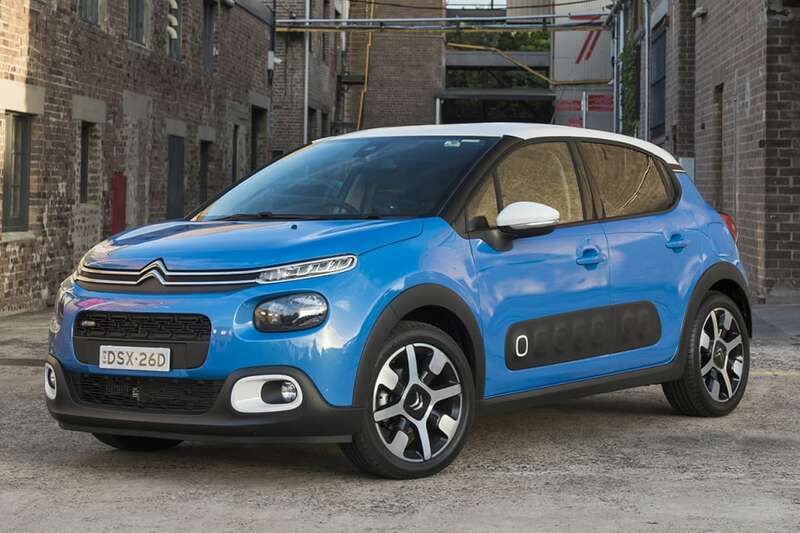 As far as smashing Citroen KPIs goes, the C3 does the trick. But it's a better car than just being a good Citroen, it's actually just a good car. 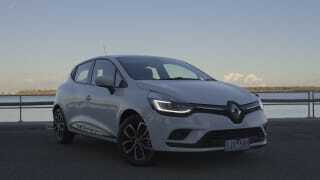 Hardly anyone knows the Renault Clio exists. But the Clio Zen has that French zing about the way it looks. 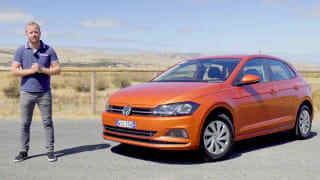 Its's also well-equipped, fun to drive, and has a good after-sales package.